An enormous 12-foot, 500-pound alligator was just captured alive in Parrish, Florida, lurking in the water. It seems all the crazy stories really do happen in Florida. The gator was captured on Dec. 19, as it was threatening divers who were working on a private project on the waterway, according to WKMG-TV. Divers detected the massive gator underwater and promptly got out to request help, according to Jim Cutway, a licensed alligator trapper who helped in the capture of the alligator. Half an hour later, a trapper from the Florida Fish and Wildlife Conservation Commission came to help Cutway capture the beast. “The divers said, ‘We’re out of here until something is done with him,'” Cutway said. To coax the gator from the water, Cutway said he and the other trapper used calls until the gator “popped” his head above the water. Eventually, the large gator was taken to an alligator farm on the state’s east coast, the WKMG-TV reported. As soon as the gator was gone, the divers returned to their underwater project, according to Cutway. Cutway typically relocates gators rather than kill them. He’s also the head beekeeper and owner of Myakka’s Gold Apiary, an interesting contrast from the massive toothy gators. Surprisingly, Cutway said this gator wasn’t the largest he’s ever caught. He said he once caught one that measured 12 feet, 6 inches long. While these figures may seem massive, the alligator pales in comparison to the Nile crocodile. The American alligator is not nearly as big as the Nile crocodile, which can get as long as 15 feet in length. While that may already sound massive, the biggest Nile crocodiles can grow as long as a giraffe is tall, according to National Geographic. While average-size Nile crocs weigh around 500 pounds, large ones can weigh up to 1,650 pounds. Another difference is head shape. Alligators have broader, more U-shaped heads; while crocodiles have longer and narrower V-shaped skulls. However, as with most things in life, there are exceptions to the rule. Mugger crocodiles, Crocodilis palustris, have a broad snout like an alligator. Habitat is another big difference. All crocodiles have glands in their tongues to help them get rid of excess salt. This helps them to live in habitats with high salt content, like mangrove swamps and estuaries. Alligators, on the other hand, prefer to live in freshwater habitats, partly because they don’t have the same salt-processing functions. However, saltwater crocodiles are happy in both freshwater and saltwater and like to swim along coastlines. Teeth, too, are a point of difference. Crocodiles are the ones that show their teeth even when their mouths are closed. The fourth tooth on the bottom jaw pokes up and sits in front of the top lip. 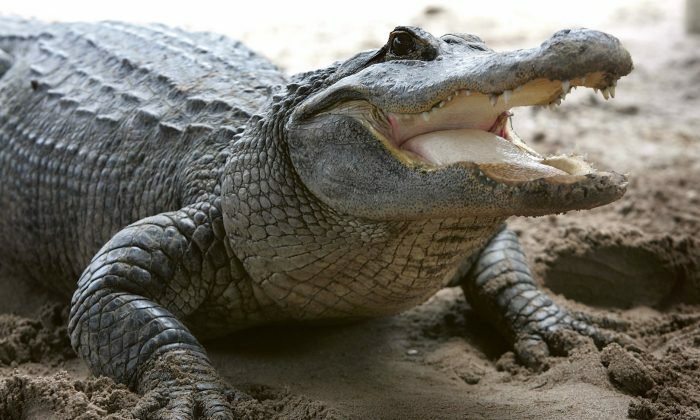 You can’t see alligators’ teeth when their mouths are closed though. Nile crocodiles also have fewer offspring than American alligators, according to Abby Lawson, a doctoral candidate in the Department of Forestry and Environmental Conservation and the South Carolina Cooperative Fish and Wildlife Research Unit at Clemson University. “Nile crocodiles are generally considered to be much more aggressive than American alligators or American crocodiles,” crocodile expert Adam Rosenblatt told National Geographic. With its man-eater reputation, the Nile crocodile can grow to 15 feet in length and have its way with all manner of animals, from hippos to humans, the National Geographic reported. Nile crocodiles aren’t picky eaters, although their primary diet consists of fish. Their indiscriminate diet means they’ll happily take a chomp out of whatever, or whomever, crosses their paths, from zebras to porcupines, humans, and even other crocodiles. At each feeding session, a Nile crocodile can eat up to half its weight. While American alligators and crocodiles account for 33 human fatalities since 2000, the Nile crocodile has killed 268 people in the same time span, according to CrocBITE, a worldwide crocodilian-attack database. Because of its vicious reputation, the Nile crocodile was hunted close to extinction in the 1940s through the 1960s. Since then, local and international protection has helped them rebound in most areas. In some regions, pollution, hunting, and habitat loss, however, have severely depleted their numbers. Actually, the Nile crocodile is not the largest crocodilian. The largest is the Crocodylus porosus, known as the saltwater crocodile, which can reach 23 feet and weigh up to 2,600 pounds.